Can't decide between pizza and lasagna? Now you don't have to! 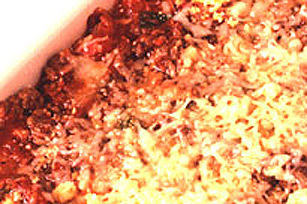 Our KRAFT Pizzeria Style Lasagna combines the best of both into one quick and easy recipe. Sauté pepperoni, mushrooms, onions, peppers and black olives in oil in a large frypan until soft. Add pasta sauce and water. Simmer 5 minutes. Combine eggs and cheeses. Set aside. Spread 1/4 of the sauce on bottom of 13 x 9 in. (33 x 23 cm) baking dish. Arrange 5 oven-ready lasagna noodles over sauce. Spread 1/3 of cheese mixture over noodles. Repeat layers twice ending with sauce. Top with additional cheese. Bake at 350°F (180°C) for 60 minutes or until hot and bubbly.